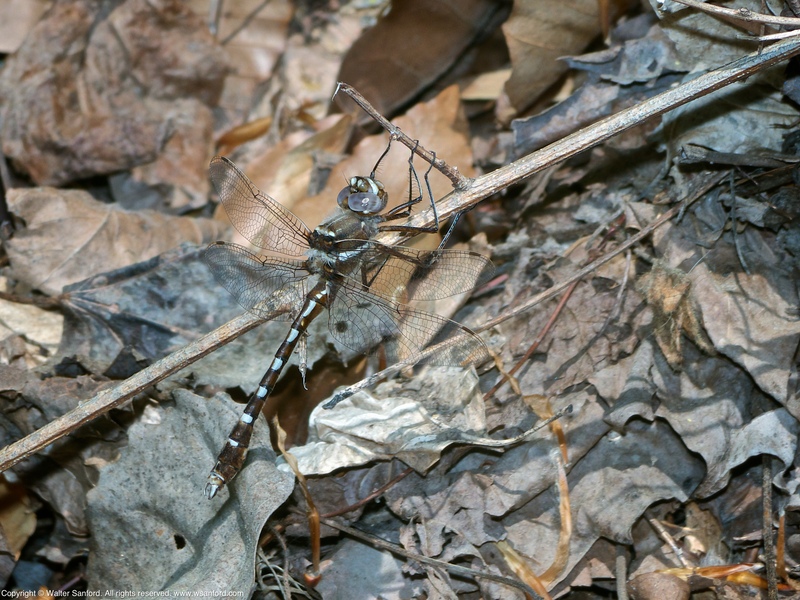 Several male Stream Cruiser dragonfly (Didymops transversa) were spotted on 20 April 2016 at Accotink Bay Wildlife Refuge. All male dragonflies have three terminal appendages: two (2) cerci; and one (1) epiproct. All three appendages are white. Male Stream Cruiser cerci are shaped differently than female cerci: male cerci look like a pair of ivory elephant tusks. If you look closely at the full-size version of the following photo, then you will notice the focus is slightly “soft.” Here’s the backstory. I waited nearly 30 minutes for this male to land in a spot where I could shoot its photo. When the dragonfly finally landed, I positioned my Coleman camp stool at a distance of approximately six feet from the subject: the dragonfly was perching on one side of a trail; I was sitting on the other side. As soon as I shot the first photo, I noticed a family of four plus a BIG dog approaching my position rapidly. I rushed to take a second shot, in case the group didn’t stop. They didn’t stop — they charged ahead, passing between the dragonfly and me. I never saw the same dragonfly again. So what’s the take-away from this negative experience? The people must have noticed that I was trying to photograph something, yet they didn’t stop and ask whether it would be OK to pass by. If they had, then I would have asked them to indulge me for a few minutes so I could shoot a few more photos. Don’t be like these people — please be considerate of photographers that you encounter, especially wildlife photographers! The last photo in this set is my favorite. It’s tack-sharp and the palette of background colors complements the coloration of the dragonfly. I love it when a plan comes together! The cavalcade of spring species of odonates continues: a first-of-season Swamp Darner dragonfly (Epiaeschna heros) was spotted on 25 April 2016 near a vernal pool at a remote location in Huntley Meadows Park. This individual is a female, laying eggs (oviposition) in soft wood. All female damselflies and many female dragonflies, especially Aeschnidae, have an ovipositor that is used to puncture aquatic plants, logs, wet mud, etc. ; eggs are placed singly in the puncture. 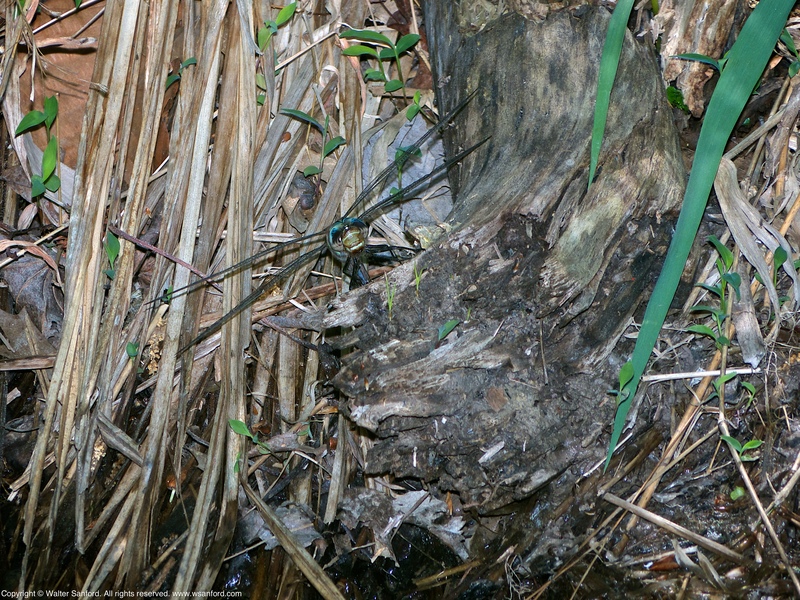 The ovipositor is clearly visible in the following annotated image. Related Resource: Swamp Darner Ovipositing in Rotting Log (NJ, USA), an excellent YouTube video (2:03) published on June 5, 2014, shot from the edge of a vernal pool located in New Jersey. 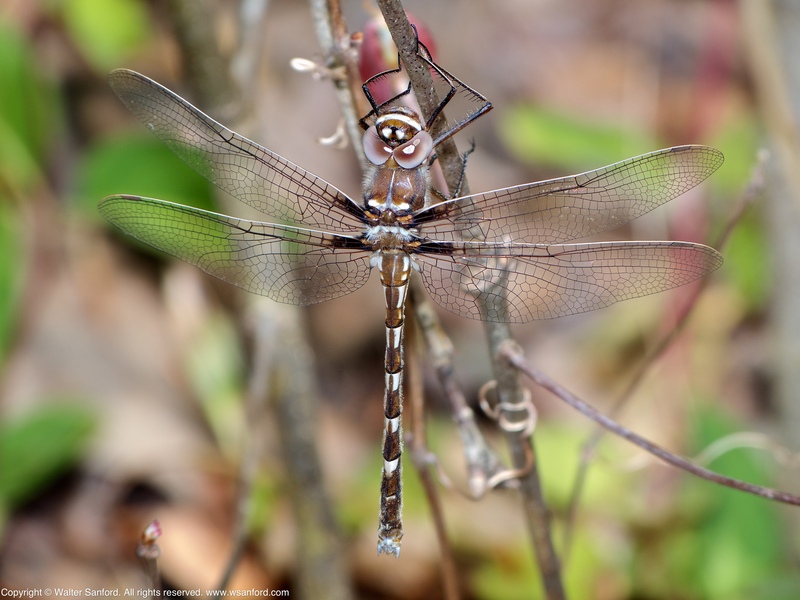 Common Baskettail (Epitheca cynosura) is a member of the Emerald Family of dragonflies that is seen during early spring in mid-Atlantic United States like Virginia. 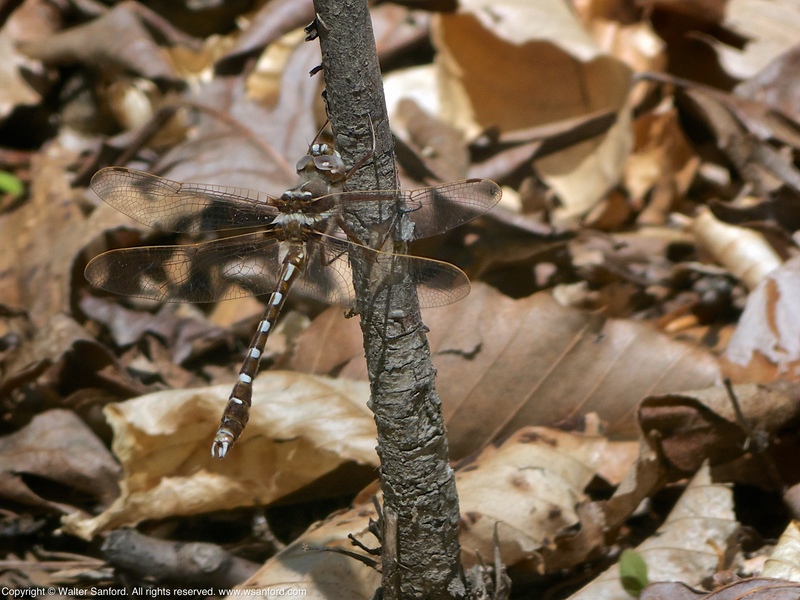 The following annotated image shows a male Common Baskettail dragonfly spotted on 20 April 2016 at Accotink Bay Wildlife Refuge. All male dragonflies have three terminal appendages, collectively called “claspers,” that are used to grab and hold female dragonflies during mating: an upper pair of cerci (“superior appendages”) and a lower unpaired epiproct (“inferior appendage”). I think baskettail cerci look “rubberized,” like the handles of metal tools made for working with electricity. Whenever I see this distinctive field marker, I know the dragonfly is probably a species of baskettail. Related Resources: Digital Dragonflies, presenting high-resolution digital scans of living dragonflies. See also What was your first clue? 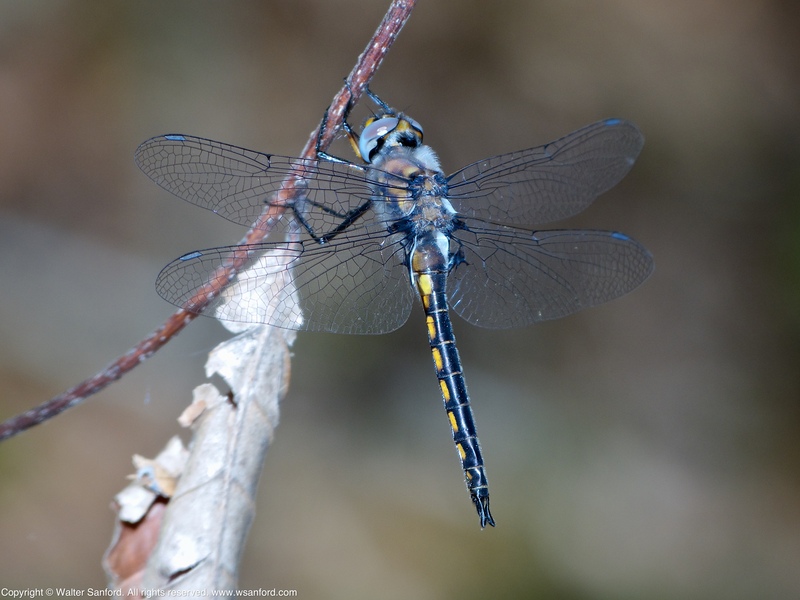 – a tutorial illustrating female Common Baskettail reproductive anatomy. The following photograph shows a Stream Cruiser dragonfly (Didymops transversa) spotted on 20 April 2016 as I was photowalking along a trail at Accotink Bay Wildlife Refuge. Key field markers for Didymops transversa include a white facial bar and a single white stripe on the side of the thorax. Male– and female Stream Cruisers are similar in appearance. This individual is a female as indicated by the pair of white terminal appendages (cerci) clearly visible at the end of her abdomen. I shot lots of photos of this individual, including many good- to very good shots. This image is one of my favorites. When editing photographs of dragonflies that like to perch in places where the background is cluttered, usually it is necessary to crop the original image. Not this photo — it is uncropped because the subject fills the frame and the composition looks good as is. I plan to post more photos of Stream Cruiser dragonflies, including this female as well as several males spotted on the same day. 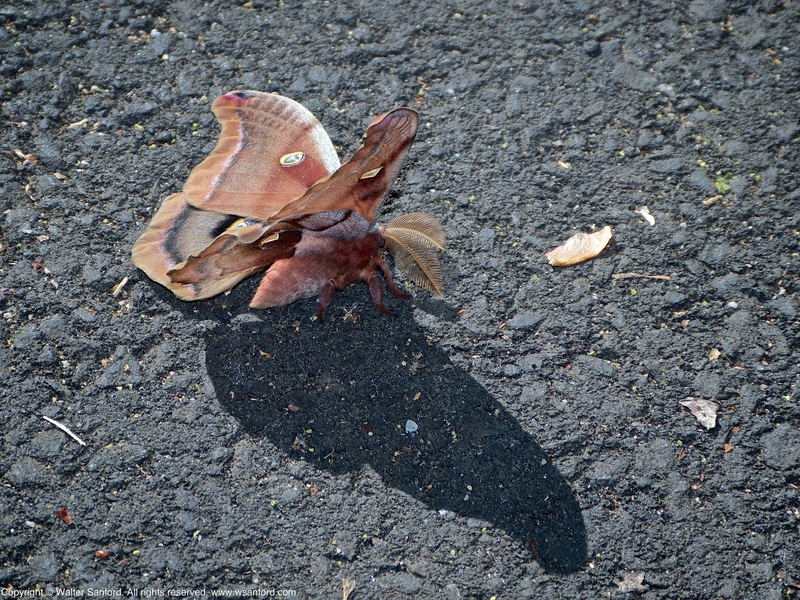 A Polyphemus Silkmoth (Antheraea polyphemus) was spotted along the Hike-Bike Trail at Huntley Meadows Park. Its wingspan is estimated to be approximately five inches from wing tip to wing tip. 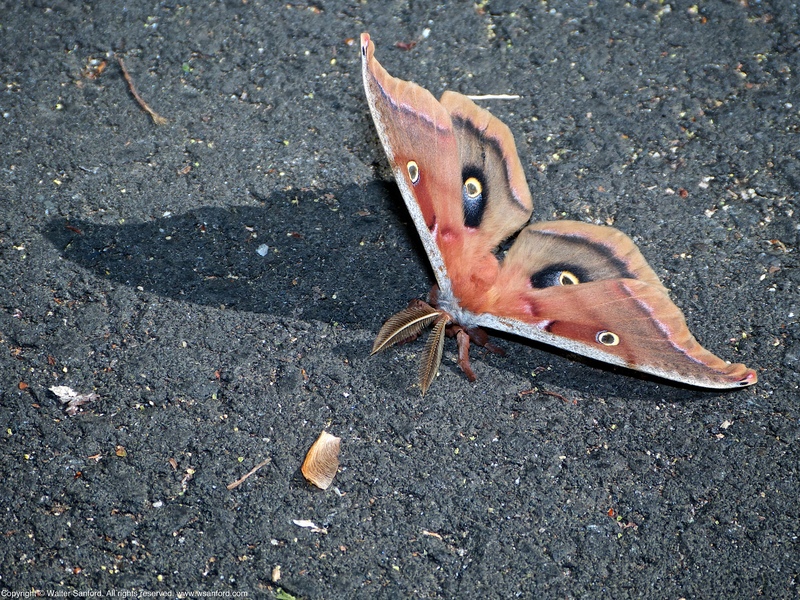 The moth seemed to be stunned but it was moving, albeit very slowly. 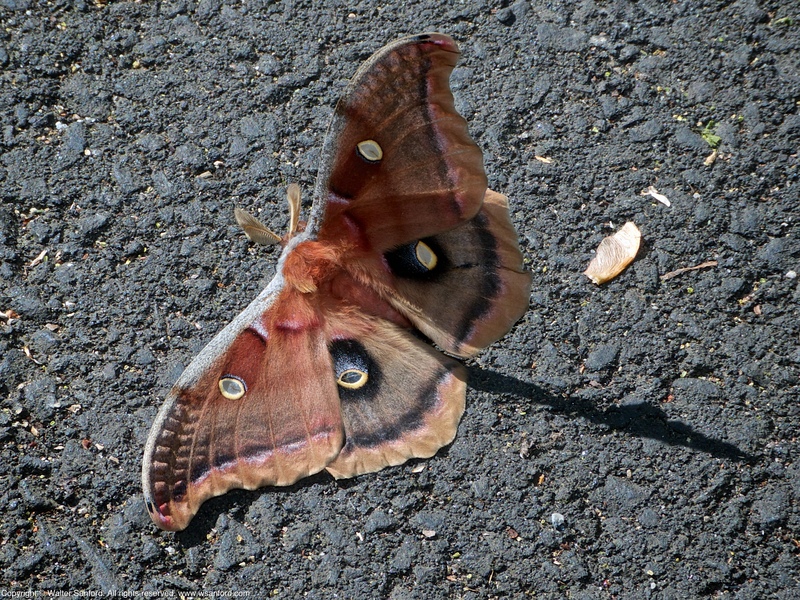 Two quotes from Butterflies and Moths of North America may explain the moth’s sluggish behavior. Life History: Adults emerge from their cocoons in the late afternoon, and mating occurs the same day from late evening to early morning. … Adult Food: Adults do not feed. 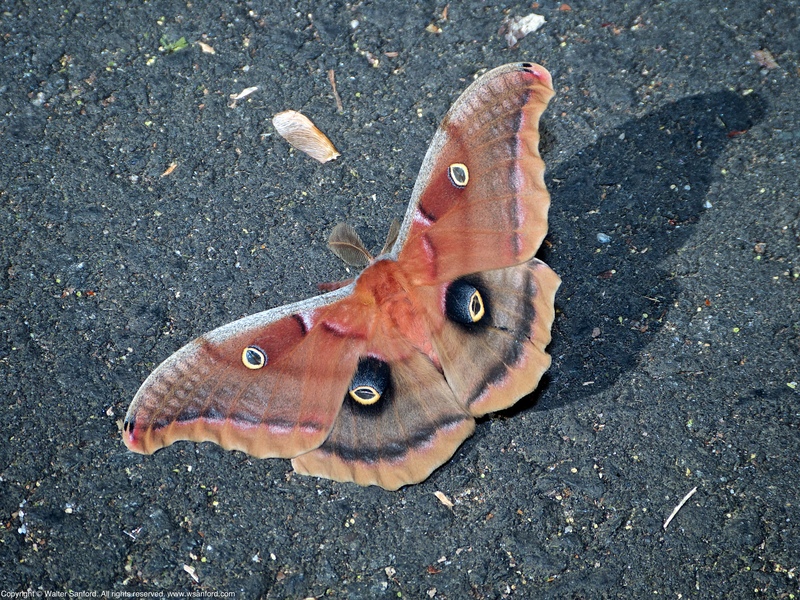 Source Credit: Polyphemus moth. 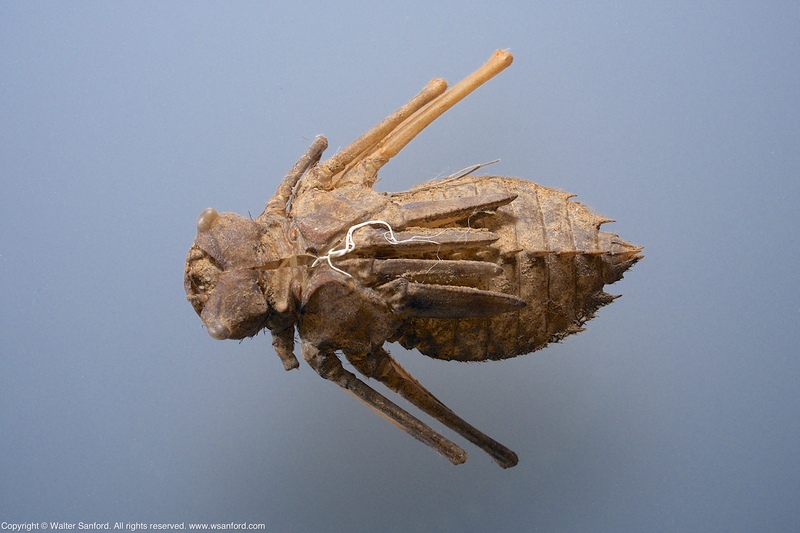 A dragonfly exuvia was collected along the Potomac River at Riverbend Park in Fairfax County, Virginia USA. This specimen is a member of the Family Macromiidae (Cruisers). The following macro photo enabled me to see most of the critical field marks required to make an identification to the family level for this specimen. Here’s the decision tree I used to tentatively identify the exuvia as a member of the Cruiser Family. The specimen has a mask-like labium. There is a horn between the eyes. Its eyes are small, wide set, and stick up. 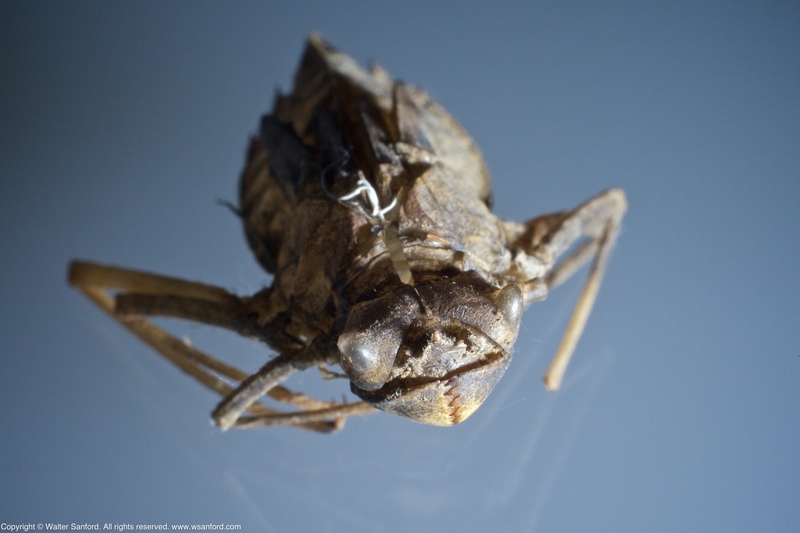 Turns out I was correct — the exuvia is a member of the Family Macromiidae! Thanks to aquatic entomologist Celeste Searles Mazzacano, Ph.D., for verifying my tentative identification. The next photo shows a dorsal view that should enable me to identify the specimen to the genus and species level, a work in progress. In Northern Virginia, probable species in the Cruiser Family include Stream Cruiser (Didymops transversa), Swift River Cruiser (Macromia illinoiensis illinoiensis), and Royal River Cruiser (Macromia taeniolata). Photo 1: Canon EOS 5D Mark II digital camera; 50mm lens (“Nifty Fifty”) plus Kenko macro automatic extension tubes [12- and 36mm extension tubes (48mm, stacked)]; Canon 580EX Speedlite (on-camera, in ETTL mode); Nissin i40 external flash (off-camera, in Video mode); and a Sunpak LED-160 Video Light with a white translucent plastic filter (off-camera). Photo 2: Fujifilm X-T1 digital camera; Fujinon XF18-55mm (27mm-82.5mm, 35mm equivalent) zoom lens plus “Fotasy” brand 10mm extension tube; Fujifilm Shoe Mount Flash EF-42 (on-camera, in TTL mode); Nissin i40 external flash unit (off-camera, in SD mode); external flashes augmented by iPhone flashlight app. Adobe Photoshop CC 2015 was used for minor touch-up work on the background of both photos. 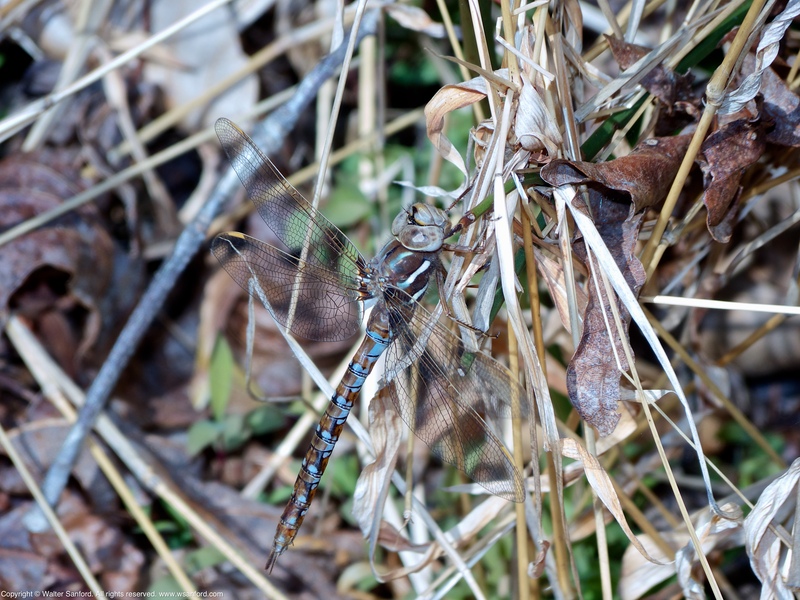 A Springtime Darner dragonfly (Basiaeschna janata) was spotted on 15 April 2016 at Huntley Meadows Park. This individual is a female, as indicated by her terminal appendages. Thanks to Michael Moore, member of the “Southeastern Odes” Facebook group, for verifying my tentative identification of the gender. Female Springtime Darners are polymorphic: the spots on their abdomen are either blue (andromorphic) or green (heteromorphic); this female is a blue morph. 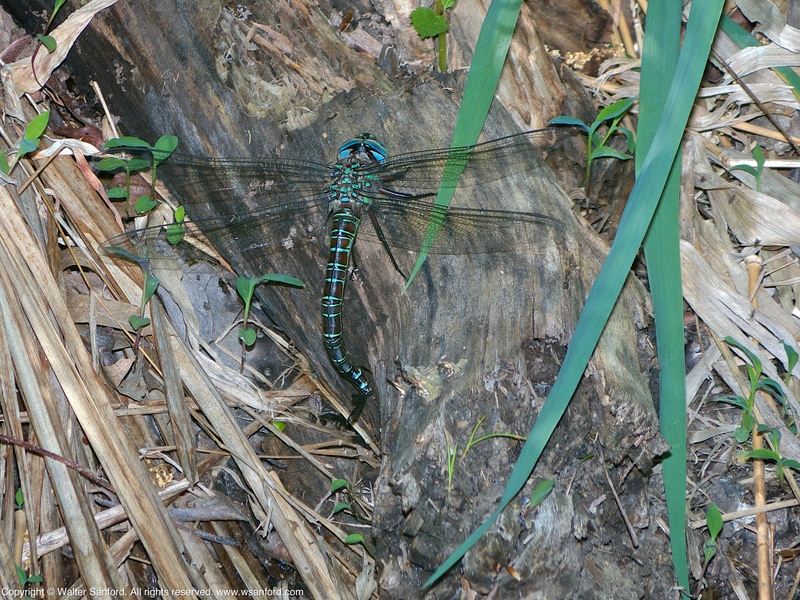 I thought of an analogy to explain the size of the Springtime Darner population at Huntley Meadows Park: Springtime Darners are more like Shadow Darners than Common Green Darners; you see Shadow Darners sometimes but not all the time, like the appropriately named Common Green Darners. 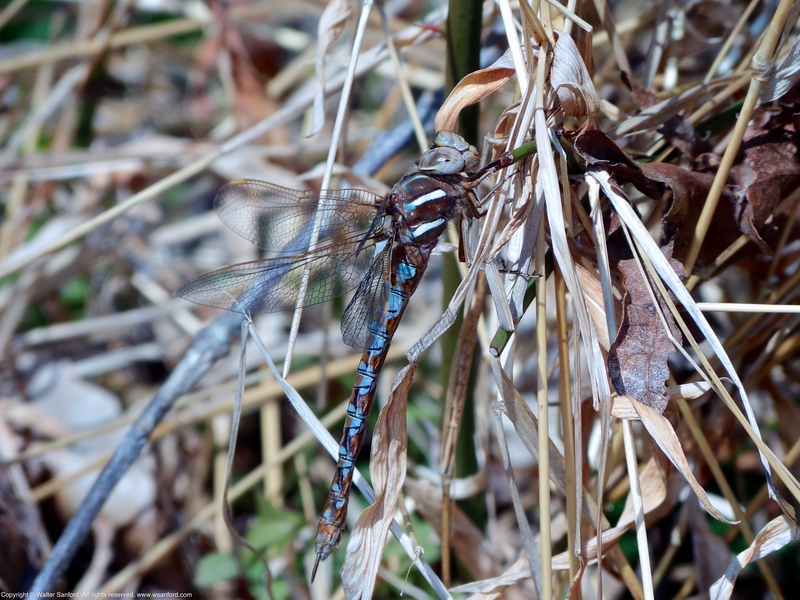 Although Springtime Darners are rare at the park, it’s worth the effort to find these beauties! 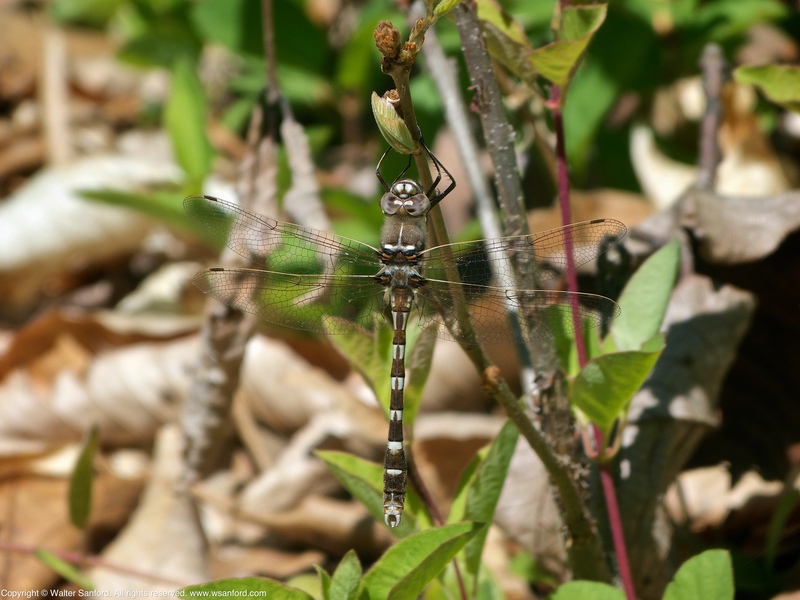 Interesting factoid: Basiaeschna is a monotypic genus; Springtime Darner (Basiaeschna janata) is the only member of the genus in the world. Uncommon and unique. How cool is that? See Mike’s excellent macro photos — well worth the risk to get so close to the snake! This past Monday as I was exploring Huntley Meadows Park with fellow photographer Walter Sanford, he spotted an Eastern Garter Snake (Thamnophis sirtalis sirtalis). We both like to photograph snakes, so we sprung into action. Following my normal instincts, I moved in close to the snake. How close did I get? At a certain point in time I actually had to back up a little to make sure I included the snake’s entire head in the image. Michael Powell and I met for a long photowalk at Huntley Meadows Park on 11 April 2016. We spotted (and photographed) a Northern Black Racer (Coluber constrictor constrictor) during the morning and an Eastern Gartersnake (Thamnophis sirtalis sirtalis) in the early afternoon. 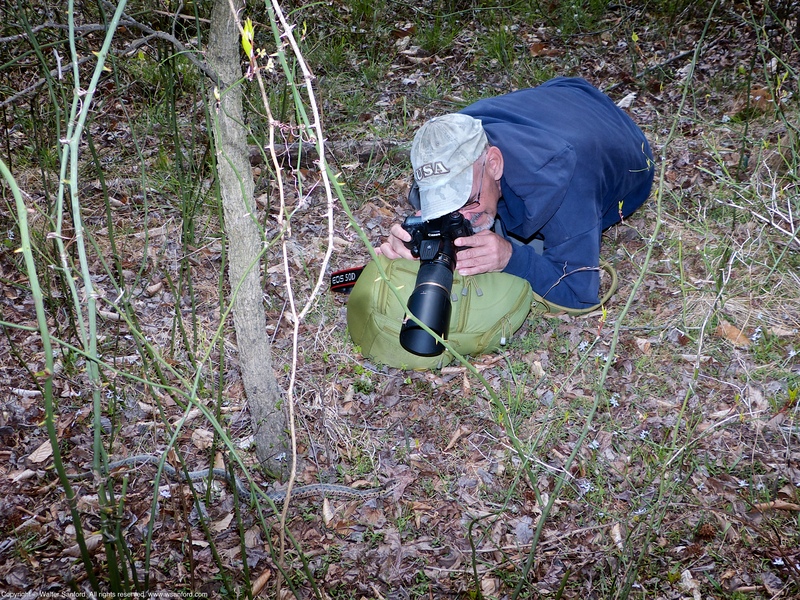 The following photo shows Michael Powell shooting the snake, up close and personal, using a field-tested technique I refer to as “Sandbagging the Grinder.” Sometimes Mike uses his camera bag for support and stability in order to shoot tack-sharp photos with a Tamron 180mm macro lens. “The Grinder” is my nickname for Mike’s macro lens because you can hear the internal gears grinding when it’s autofocusing — it’s loud, but hey, it works well in the hands of a skilled photographer! The preceding photo is the next shot I took after taking the photo of Mike. I was shooting with a Panasonic Lumix DMC-FZ150 superzoom digital camera — my go-to camera for long walks in the field. I was sitting on my Coleman camp stool. The camp stool enables me to get closer to subjects either on- or near the ground, without belly-flopping like Mike. And I think it’s easier to hold my camera rock-steady when I’m sitting on the chair with my elbows resting on my knees. Regular readers of the “Huntley Meadows Park Community” Facebook group know I recently commented on a post showing a young woman shooting photos of a Northern Black Racer by crouching on the ground about three feet in front of the snake’s face. I like to get as close as possible to the wildlife I photograph, but it’s important to do so safely. Snakes, especially Northern Black Racers, can move quickly and unexpectedly — when you position yourself in the line of fire in such a way that you can’t react and move just as quickly, you risk being bitten. Both snakes that Mike and I photographed startled us when one minute we’re shooting photos and the next second the snakes slithered away like they were shot out of a canon! In this case, it’s possible I distracted the gartersnake enough to afford Mike the opportunity to get closer than he could have if he were alone. Only the snake knows what it was thinking at the time. But I know this: I would never do what Mike did. 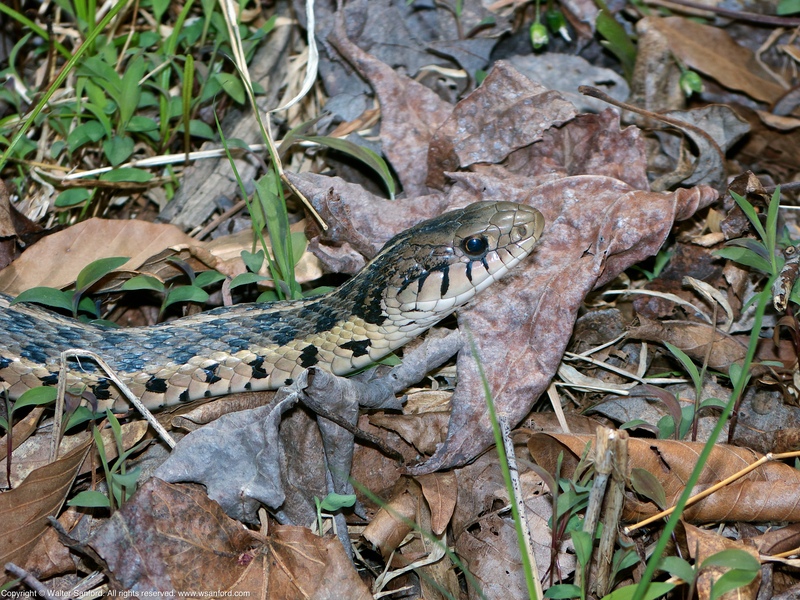 That being said, if one is going to risk being bitten by a snake in order to get some good close-up shots, then an Eastern Gartersnake is probably a lower risk than a Northern Black Racer. Bottom line: Let’s be careful out there! 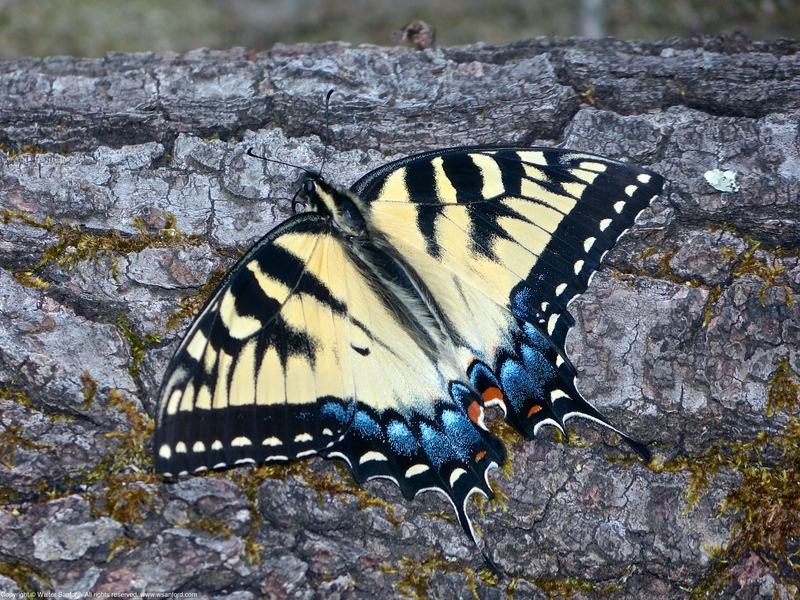 An Eastern Tiger Swallowtail butterfly (Papilio glaucus) was spotted during a photowalk at Huntley Meadows Park on 11 April 2016. This individual is a female, as indicated by the blue and orange markings on the lower edge of her hindwings, shown prominently in the following photograph of the butterfly’s ventral side. 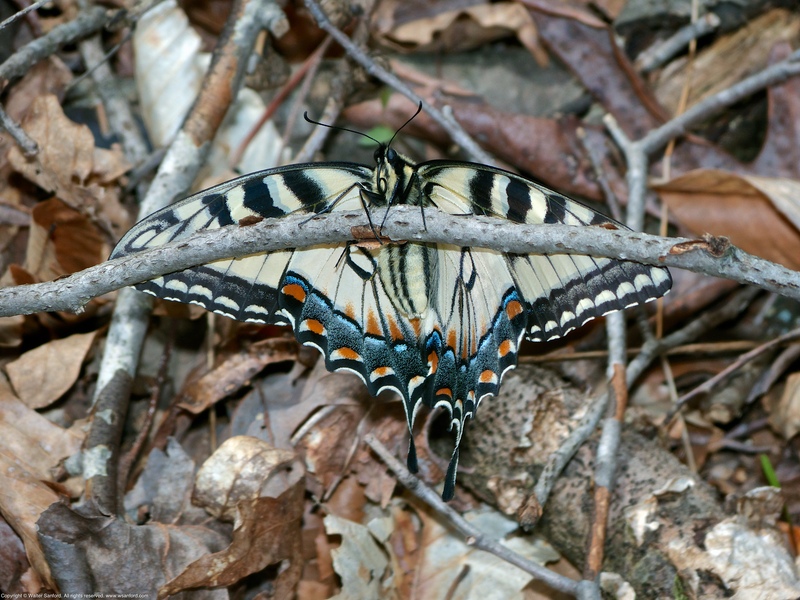 Eastern Tiger Swallowtail females are polymorphic: a yellow morph, like this one; and a dark morph. 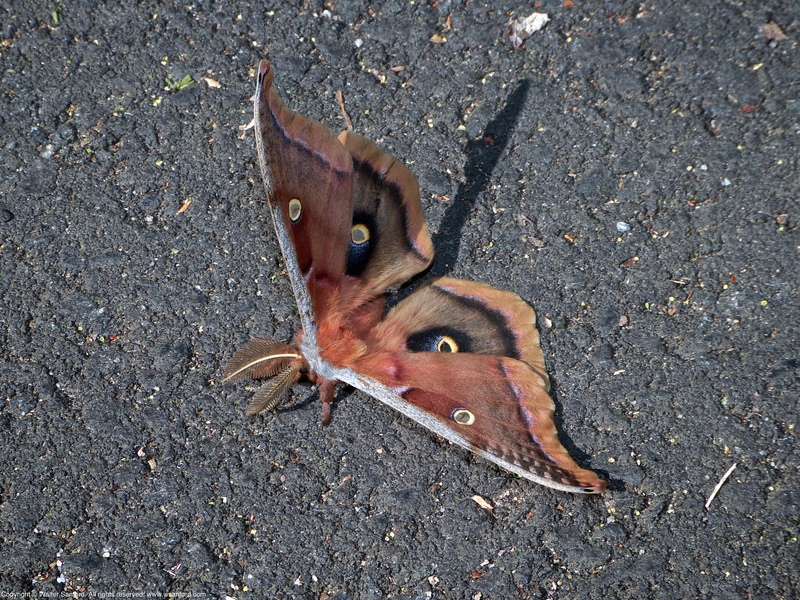 This beauty was perching near the ground, where she seemed to be sheltering from strong wind. You are currently browsing the walter sanford's photoblog blog archives for April, 2016.